Edit: Oops forgot one thing. If you're interested in seeing things posted even earlier (I post stuff there before I post here), consider supporting me on Patreon! Ooh, check out dat coral reef- now with 120% less bleach! 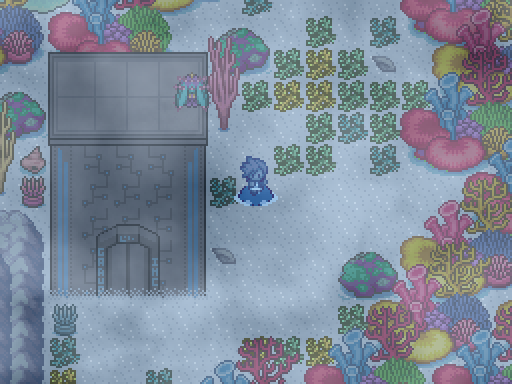 Seems like the oddly vibrant colors from Flora's trees in Route 3 have bled beneath the sea, hm? Also, am I the only one who's a tad amused that this thread cropped up the same day Commander dropped a review for this game? 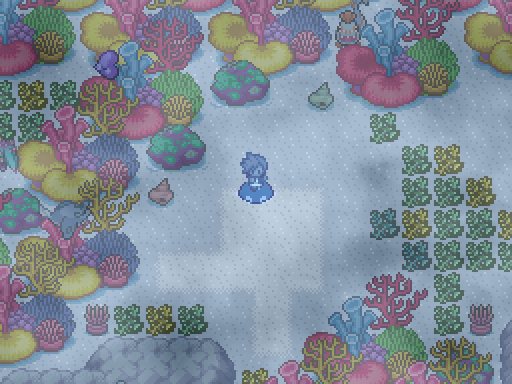 That coral reef is gorgeous, and even if it's not a coral reef it makes me feel I'm like I'm more submerged in the ocean waters; there's more life underwater than just kelp, looking at you hoenn. Keep doing amazing Jan and team. Already!!! Jan you and the dev team are amazing but, make sure you guys rest up abit. Lord knows you guys deserve it. It has only been a month what.......... the amount of effort you guys put into this game is just so impeccable. We really don’t deserve all of you. Oof Jan I know you won't let us down, I wish you and the dev team all best. God speed! I am so looking forward to how the tournament will turn out!!! Always excited when I see these, really excited for V12, good luck to Jan and the dev team! Oh damn it begins. Let the waiting games begin! It's funny because a few hours ago I was thinking "Huh. I'm surprised Jan hasn't posted a V12 thread yet." 10 minutes later and the thread shows up. I had no Idea this thread existed until now. Location:Sheridan village, Apophyll academy(birthplace), Route 9(favorite vacation spot). Ok, I'm from India. The dive area O.O i just love it. Wow, you sure have a knack for these things. I have known that since V8. Thanks a lot. And now the wait for Xenoblade Pokemans version 12 starts anew. Wooooo. The other countdown begins. *rolls* V12 time soon (eventually)! Aaaa! well its that time again well its that time again so see what amazing content Jan and his crew has to show us. excited as always to see whats in store for us next.